Want to be notified of new releases in unosquare/passcore? ⭐️Please star this project if you find it useful! PassCore is a very simple 1-page web application written in C#, using ASP.NET Core , Angular Material, Typescript, and Microsoft Directory Services (Default provider). It allows users to change their Active Directory password on their own, provided the user is not disabled. PassCore does not require any configuration, as it obtains the principal context from the current domain. I wrote this because a number of people have requested several features that the original version did not have. The original version of this tool was downloaded around 8000 times in 2.5 years. My hope is that the new version continues to be just as popular. There really is no free alternative out there (that I know of) so hopefully this saves someone else some time and money. Responsive design that works on mobiles, tablets, and desktops. You can easily install using Powershell. Check the next section to know how. Make sure the Domain field contains the correct setting. You need a Passcore copy to continue. We recommed to download the latest binary release of PassCore. NOTE: Before extracting the contents of the file, please right click on it, select Properties and make sure the file is Unblocked (Click on the Unblock button at the bottom of the dialog if it is available). Then, extract the contents of the zip file to the directory where you will be serving the website from. If you download the source code you need to run the following command via an Command Prompt. Make sure you start the Command Prompt with the Administrator option. dotnet publish --configuration Release --runtime win-x64 --output "<path>"
The <path> is the directory where you will be serving the website from. Install the .NET Core 2.2.3 Windows Server Hosting bundle. Go to your IIS Manager, Right click on Application Pools and select Add Application Pool. A dialog appears. Under Name enter PassCore Application Pool, Under .NET CLR Version select No Managed Code and finally, under Managed pipeline mode select Integrated. Click OK after all fields have been set. Now, right click on the application pool you just created in the previous step and select Advanced Settings .... Change the Start Mode to AlwaysRunning, and the Idle Time-out (minutes) to 0. Click on OK. This will ensure PassCore stays responsive even after long periods of inactivity. A dialog appears. 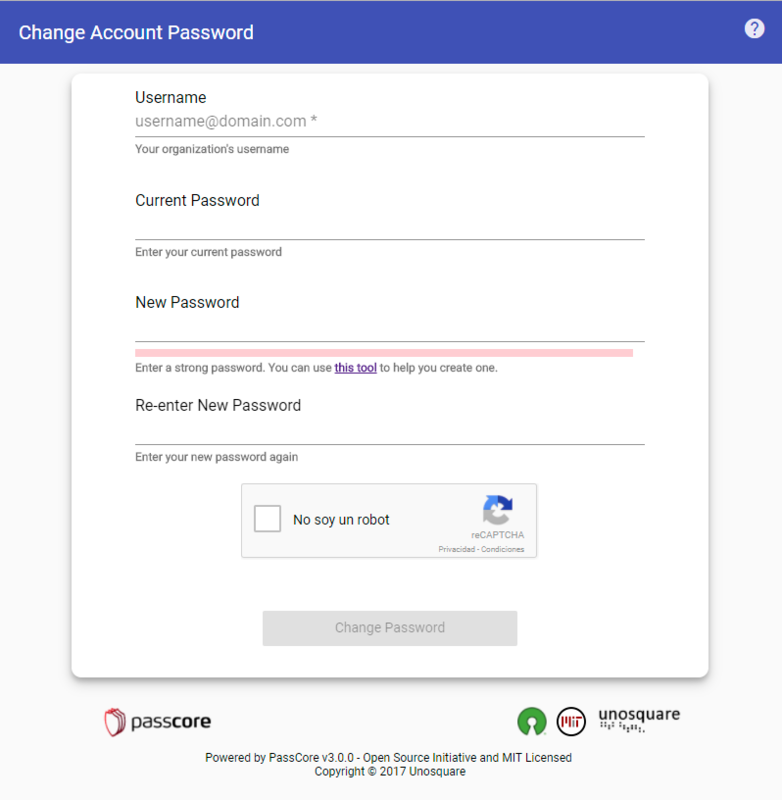 Under Site name, enter PassCore Website. Under Application pool click on Select and ensure you select PassCore Application Pool. Under Physical path, click on the ellispsis (...), navigate to the folder where you extracted PassCore. Important: Make sure the Physical path points to the parent folder which is the one containing the files, logs and wwwroot folders. NOTE: If the folder logs is not there you can created. To enable the logs you need to change stdoutLogEnabled to true in the web.config file. You need to add Full Control permissions to your IIS Application Pool account (see Troubleshooting). Under the Binding section of the same dialog, configure the Type to be https, set IP Address to All Unassigned, the Port to 443 and the Host name to something like password.yourdomain.com. Under SSL Certificate select a certificate that matches the Host name you provided above. If you don't know how to install a certificate, please refer to SSL Certificate Install on IIS 8 or SSL Certificate Install on IIS 10 , in order to install a proper certificate. Important: Do not serve this website without an SSL certificate because requests and responses will be transmitted in cleartext and an attacker could easily retrieve these messages and collect usernames and passwords. Click OK and navigate to https://password.yourdomain.com (the host name you previously set). If all is set then you should be able to see the PassCore tool show up in your browser. NOTE: If you have a previous version, you can not use the same appsettings.json file. Please update your settings manually editing the new file. Using the command shown above will install to the folder C:\passcore and using the HTTP Port 8080 with the default (localhost) binding. If you want to customize your installation please download the installer script and the IIS setup script. NOTE: You need PowerShell version 5 or better to execute the script. docker build --rm -t passcore . NOTE: Docker image contains a build using the LDAP Provider (see below). PassCore was created to use the Microsoft Active Directory Services provided by .NET Framework, but a new Provider using Novell LDAP Client can be used instead. This provider is the default when PassCore is running at Linux or MacOS since Microsoft AD Services are NOT available. The configuration of the LDAP Provider is slightly different. for example, the AutomaticContext is not available and you need to supply credentials. Find the RestrictedADGroups entry and add any groups that are sensitive. Accounts in these groups (directly or inherited) will not be able to change their password. Find the DefaultDomain entry and set it to your default Active Directory domain. This should eliminate confusion about using e-mail domains / internal domain names. NOTE: if you are using a subdomain, and you have errors, please try using your top-level domain. Thank you. This helps the user incase they forgot thier username and, also comes in handy when sending a link to the application or having it embeded into another application were the user is all ready signed in. To specify which (DC) attribute is used to search for the specific user. With the IdTypeForUser it is possible to select one of six Attributes that will be used to search for the specifiv user. The rest of the configuration entries are all pretty much all UI strings. Change them to localize, or to brand this utility, to meet your needs. At first run if you find an error (e.g. HTTP Error 502.5) first ensure you have installed .NET Core 2.1.1 Windows Server Hosting bundle, or better. in the Run Window, enter "OptionalFeatures.exe"
If you / your user's current password never seems to be accepted for reset; the affected person may need to use a domain-connected PC to login and reset their password on it first. Updated group policy settings could be blocking user changes, until a local login is completed. If you find Exception from HRESULT: 0x800708C5 .The password does not meet the password policy requirements trying to change a password. Set 'Minimum password age' to 0 at 'Default Domain Policy'. User @gadams65 suggests the following: Use the FQDN of your LDAP host. Enter the LDAP username without any other prefix or suffix such as domain\\ or @domain. Only the username. You can also opt to use the Linux or MacOS version of PassCore. This version includes a LDAP Provider based on Novell. The same provider can be used with Windows, you must build it by yourself. If you need to modify the source code (either backend or frontend). You may require to install [.NET Core SDK}(https://dotnet.microsoft.com/download) and Node.js. Run the following command according to your target platform. dotnet publish --configuration Release --runtime linux-x64 /p:PASSCORE_PROVIDER=LDAP --output "<path>"
dotnet publish --configuration Release --runtime osx-x64 /p:PASSCORE_PROVIDER=LDAP --output "<path>"
Note - The PASSCORE_PROVIDER modifier will use the LDAP Provider instead of Active Directory Provider. PassCore is open source software and MIT licensed. Please star this project if you like it.